doesn't look like as much water as Hoenn. It is a lot more . . . . connected than the others. 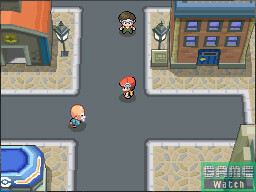 Most of the cities are connected by 3 routes, like mauville and saffron. those blothes of blue .. . r they lakes? i'm really looking forward to this gen. I think they are lakes. And yes a lot less water than Hoenn you're right. I think the dominating feature of this region is it's central mountain range. I can't wait to cross it! they gotta be lakes cause look at the big map. on the lower left hand corner theres a lake. look closely in the middle of the mountains on the left side, it looks like theres a city/town cuddled right there. this is gonna be soooooo cool. Last edited by DarkPhantom02 on Wed Aug 16, 2006 2:41 pm, edited 1 time in total. That's a fantastic map, it gives you a good idea of what this place is going to be like. If you look closely along the mountains, you can see a few buildings on their own hiding away. If you start at the bottom and work your way up to number 3, it looks like the major city like Slateort or Saffron! Could this be it? Remember the snow walk in the movie. Look at the north-eastern corner of the map... i think the scene takes place there. In the Shinou map, it seems that there isn't much water, compared to Hoenn. Maybe in Pearl/Diamond you get HM03 Surf very late in the story, maybe like after the 6th or the 7th Badge. I'm only talking about the first map thats posted in this thread. There is a body of water which blocks the trainer at Route 219 so I think surf would have to be gotten by then. But of course there could be alternate routes. And yes, the deep snow appears to be in the north-east. I'm guessing that Futaba Town is the four houses down around the South-West area, I can't wait for this game either. Ooo, excelent. When you identified Futaba Town I followed the route. It seems you begin in the west and travel north next to the mountains then up and over to the east. When you look at the map theres only 1 water pass i see conecting to that island. But theres a second one with no path to it. Maybe this is waht the ferrie is for? Also that northern town looks like the E4 Hq. Also that northern town looks like the E4 Hq. The very tippie top of the north-east corner of the mountains is where the E4 is. You can tell cause of the gate looks. When you look at other regions with maps like that, you see a gate-like structure. It right there so thats where the e4 is. . . .
EDIT:*Here's something I did. I edited the map and put the locations of what we know, possible locations, and stars where there could be towns, or there is. I am pretty sure that the map will have an extension. See hoe the road keeps going? I think that goes into another area. Of course it does. Look at the map M (can I call you that?) posted at first. Of course that can't be all there is. . . . . good eye though. Anyway, I think that there will be more pokemon in this game than any other, because this one has the biggest map in my opinion. Looks to me if it will be fantastically huge. And I'm glad it has less water than Hoenn. I haven't seen a region with loads of walking for a while. Yes, It's definitely better than Hoenn. I hate the route's 127-131 etc. ! I hate surfin because of the tentacools and wingulls and stupid tentacool & magikarp training swimmers! Wow, looks interesting! That big moutain range is probably gonna be like Metor Falls/Dark Cave/Mount Moon, where you go underground under it. Or maybe you can go over and under it! There's definitely not as much water as Hoenn.. I think Shinou will attatch with the other regions sort of north of Johto/northwest of Kanto?